If last Tuesday was an example of just how low Prime Minister Theresa May now is, then political obituary writers had best dust down their stories and revise them for an ever-nearing date. If she was a milk bottle, the best-before date would be long past. On Tuesday, May’s Conservative minority government lost three votes in the House of Commons. 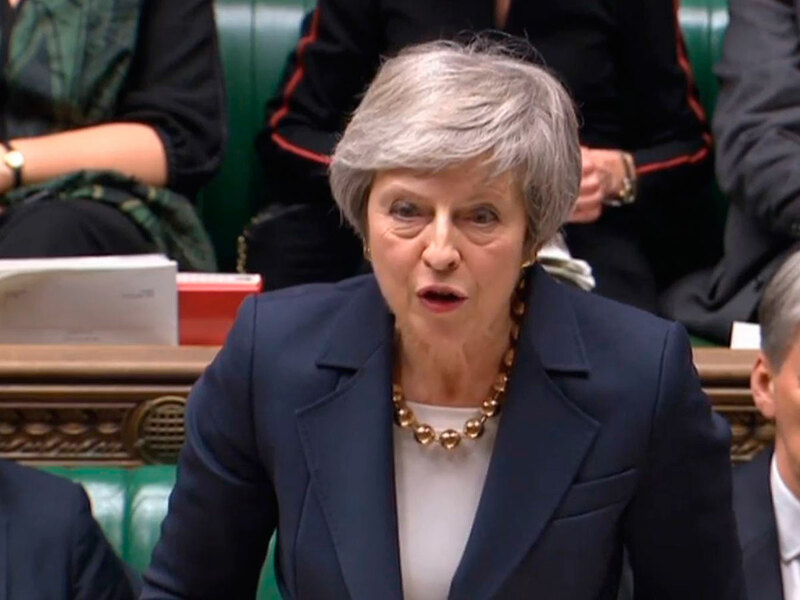 The first two concerned May’s Government being in contempt of parliament for refusing to release a full legal opinion penned by the Attorney General, Geoffrey Cox, on the deal reached between Her Majesty’s Government and the European Union (EU) over the terms of divorce of Brexit. Not for the first time, the so-called “backstop” — the legal guarantee the UK gave Brussels over maintaining an open border between the British-governed province of Northern Ireland and the Irish Republic to the south — was at the knub of debate. Cox had argued that the advice was sensitive and should have been kept from parliament. Nonsense, a majority of members of parliament voted, essentially saying that now more than ever parliament and UK voters needed to know exactly what the May government was agreeing to, and its long-term consequences. And it’s hard to disagree with that majority. This whole Brexit debacle is coming to a crescendo over the next two weeks and, with or without May as Prime Minister, MPs need to know exactly the implications of what they’re voting on when they walk through the division gates on Tuesday. That’s why May was on a road to nowhere, trying to keep the legal advice under wraps. The government was to release the full text of the legal opinion, an embarrassing climb-down and, more importantly, an embarrassing smack-down for May who now will most definitely lose that vote to back her much-vaunted agreement with Brussels. Why? Adding insult to injury for the defeat on those two first Tuesday votes, the Democratic Ulster Unionists MPs from Northern Ireland, on which May relies for her Conservative government to rule, turned tails on the Tories and voted with the opposition. That’s a clear warning to May their days are numbered — but then again so too are May’s. Consider that in the third losing vote of Tuesday — before the five days of parliamentary debate on the Brexit agreement even began — May’s government lost on an amendment that would require MPs to have a meaningful final say should the Commons reject the Brexit deal, and it lost even with those DUP MPs supporting the Tories. In other words, this third vote is a clear indication that even with the DUP MPs by her side — they won’t be, as they already said they intend to vote against the Brexit deal because of that backstop — May simply hasn’t got the numbers. The reality is that come the evening of December 11, May’s grand Brexit strategy will go up in smoke, and bonfires are already lighting and there’s no shortage of MPs willing to put a match to the paper it’s written on. Right now, it’s hard to say — but there are opportunities opening. On Tuesday morning, before all the parliamentary manoeuvring and shenanigans were underfoot at Westminster, at the European Court of Justice in Strasburg, Campos Sanchez-Bordona offered words of encouragement that have suddenly taken on a new significance at this eleventh hour in this whole Brexit debacle. Sanchez-Bordon is the court’s Advocate General and offered that he believed Article 50 of the Lisbon Treaty — the clause that allows for nations to leave the EU and activated by the British government to take effect on March 29 — could be revoked by the London government alone without having to seek approval from all other 27 members of the EU. In other words, it’s like as if Santa Claus came early for every Remainer across the disunited kingdom, offering hope that Brexit might be reversed. Suddenly, there’s a glimmer of hope that indeed sanity might somehow prevail, and there’s a chance that if the Brits changed their minds, said they were really, really, really sorry, and withdrew the notice period under Article 50, things might carry on as if the Brexit debate and debacle was just one big long nightmare. Yeah, right! As if that’s going to happen. There are European Parliament elections set for the last week in May — and the last thing the EU, the European Commission or many of the EU nations that are staring down their own populist anti-Brussels movements will do is have the Brexit mess unsettled. In a day of such political excitement at Westminster, there was one brief footnote that likely went missing: Nigel Farage, the founder of the United Kingdom Independence Party that pushed and pushed for Brexit for so long, has quit the party. Why? He doesn’t like the anti-Islamophobic policies it is adopting. It’s too late. Like with Brexit, that genie is long out of the bottle.